A cultivar of Camellia japonica L. ‘Pompone’ is a very variable camellia, with several different flower forms coexisting on the same plant. The flowers are up to 10cm across, with 10-12, large outer petals in 2 rows, and smaller inner ones in an erect, irregular mass. The petals are typically white, the bases tinged with rose, and with a small stripe in the centre. Some flowers are quite deep red, or rose, or variegated. [ICR, Hortus]. ‘Pomponia plena. – Leaves oval, elongate, very acute, smooth near extremities, recurved downwards, finely dentated, of a dull green, two inches broad and three long; some of them of larger size; a vigorous shrub, branches diffuse, and disposed to shoot out in all directions, without order, if they are not regulated by pruning; buds large, rounded, scales green; flower very large, four and a half inches in diameter, full and of a pure white. The petals of the circumference are flat or undulating, those of the centre are concave, white, at the claw red, with sometimes shades of light yellow. This beautiful variety, is not uniform in the colour of its flowers, for often there are seen on the same plant, red, rose, and white.’ – Magnificent.’ [Berlèse Monography p.49/1838]. It was imported from China by Kew Gardens in 1810. [ICR]. ‘It is a free growing sort, more lax in its branches than some of the kinds. In this, and other respects, it so strongly resembles the paeonaeflora, that it is not possible to distinguish them when out of flower: the leaves are perfectly similar.’ [LBC no. no.596/1821]. 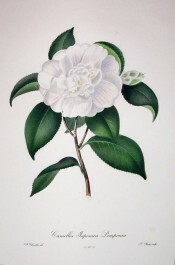 A very important parent plant in early European and Australian camellia breeding and probably used by William Macarthur. BR f.22/1815. Chandler pl.9/1831. Listed in all published catalogues [T.266/1843]. ‘Variabilis’ was among the camellias positively identified at Camden Park by Walter Hazlewood, with some reservations, in the 1930’s. He described it then as ‘variable colour, white with a few red flakes; rosy red with a few white marks and marblings; white with a few red petals; 4 rows of outer petals, centre 2 or 3 groups of petaloids with a few petals mixed among them’. [TJSC]. ‘Pomponia’ is listed in both the 1830 and 1836 editions of Loddiges’ Nursery catalogue, copies of which are held at Camden Park [CPA]. In the 1830 edition it is marked with an ‘x’, which usually denotes common before or long introduced, and in the 1836 edition with a ‘c’, denoting grown at Camden. ‘Pomponia’ is also marked ‘x c’ in an article by ‘G.A.L’ in the Horticultural Register. Although this book originally belonged to James Bowman, it is likely that this plant was grown by the extended Macarthur family earlier than 1843. Probably obtained from Loddiges’ Nursery. It was named variabilis in both the 1830 and 1836 Loddiges’ catalogues held at Camden Park and marked with a ‘c’, denoting grown at Camden, in the latter [CPA].